Uber concealed a hack that affected 57 million customers and drivers, the company has confirmed. The 2016 breach was hidden by the ride-sharing firm which paid hackers $100,000 (£75,000) to delete the data. The company's former chief executive Travis Kalanick knew about the breach over a year ago, according to Bloomberg, which first broke the news. The hackers found 57 million names, email addresses and mobile phone numbers, Uber said. Within that number, 600,000 drivers had their names and licence details exposed. A resource page for those affected has been set up. 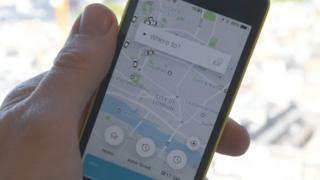 Drivers have been offered free credit monitoring protection, but according to Uber's statement, affected customers will not be given the same. "While we have not seen evidence of fraud or misuse tied to the incident, we are monitoring the affected accounts and have flagged them for additional fraud protection," Uber's chief executive Dara Khosrowshahi said. "While I can't erase the past, I can commit on behalf of every Uber employee that we will learn from our mistakes." In the wake of the news, Uber's chief security officer Joe Sullivan has left the company. Uber did not confirm precise details of the hack - and it is not known which countries were affected - but according to Bloomberg's report, two hackers were able to access a private area of Github, an online resource for developers. From there it is understood they found Uber's log-in credentials to Amazon Web Services. AWS is a cloud computing service used by companies to store data. As is often the case, it will likely be the cover up that proves more bothersome for Uber than the hack itself. Uber has form. In January it was fined $20,000 for failing to disclose a considerably less serious breach in 2014. Managing Uber appears to be like a game of Whac-A-Mole - no sooner has one crisis been dealt with when another one rears its ugly head. This latest scandal, however, threatens to tear apart an already fragile truce between Uber's former chief executive Travis Kalanick and Benchmark, the shareholder that trounced him from the top job then tried to kick him off the board. These two managed to park their hostilities in order that an investment by Japanese conglomerate Softbank - thought to be worth up to $10bn - would go ahead. But the fact that Uber concealed a massive data breach, which Mr Kalanick knew about a year ago, will do nothing to help matters. Softbank's investment is significant for Uber because it will result in a significant reform of its board and help the business improve its corporate governance, something that desperately needs to be overhauled. Uber's new chief executive Dara Khosrowshahi appears to be starting as he means to go on. In his statement regarding the data breach, he said the company needed to be open and honest if is to "repair our past mistakes". Rajeev Misra, a board director at Softbank, described progress on a deal with Uber as "long and arduous". With Uber's latest problems, it may become a whole lot tougher.